In most MMOs today it's common for characters to have a wide range of skills and to hold multiple professions. As going out and gaining experience and levels is often times the only way to raise your crafting professions, virtually every character is required to be some kind of an adventurer - whether they want to or not. On the other end of the spectrum, as we discussed in the last design journal Contracts and Player-Created professions, the lack of trust inherent in MMOs forces players to become gatherers or crafters in order to get high-quality items. As a result, many modern MMOs require characters to be adventurers, gatherers, and crafters all at the same time. While those ideas may work in MMOs where there's no time limit, in a world where your character ages and eventually dies, that isn't ideal. In the end, the limited life-span in Chronicles of Elyria means that more often than not, having a small set of specialized skills is better. Plus, it allows players to focus on the area they enjoy most, whether that be exploring, gathering, or crafting. 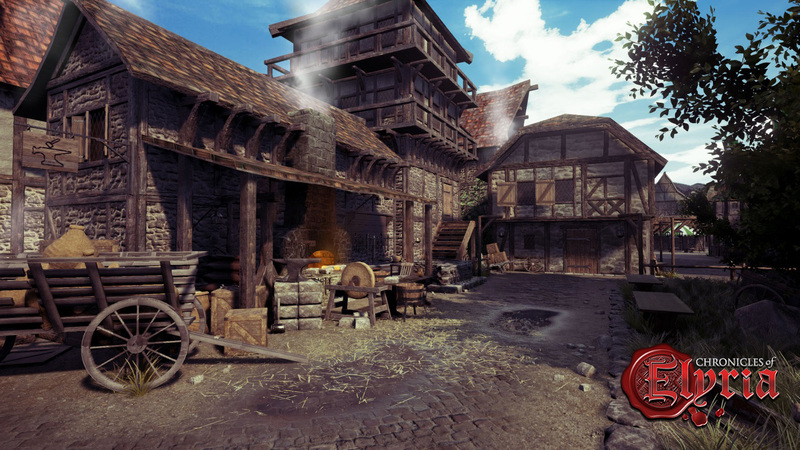 In part one of this two-part series on “Skills and the Skill System” we’re going to talk about how Chronicles of Elyria uses division of labor to allow players to focus on just the areas of the game they want to. After that we’ll talk about the different skill categories, how skill hierarchies work, and the multiple ways players can advance their skills. Different skill sets require different tools and equipment. 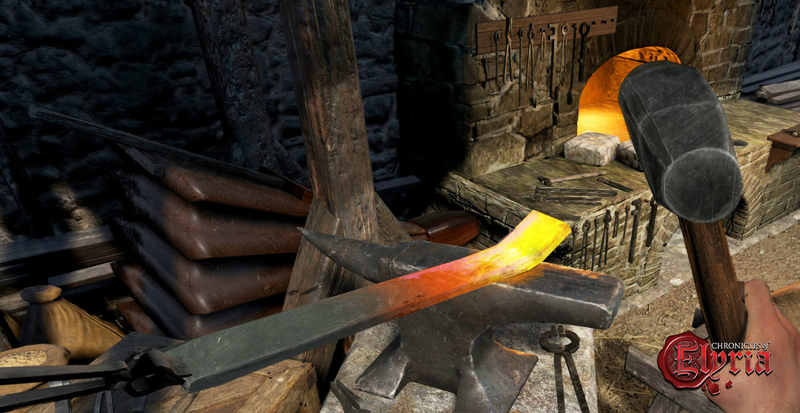 For example, blacksmiths need access to a forge and appropriate tools for working with metal, clothing that won't catch on fire, gloves that prevent them from burning themselves, and a place to store materials before beginning production. In contrast, merchants and miners will often need reliable transportation capable of carrying a lot of cargo or heavy loads. At the same time, travel by wagon is slow and incapable of maneuvering into narrow places amongst trees and brambles. Finally, while blacksmiths, miners, and merchants all have skills in their specific trades, none of them have need to be expert swordsmen. These observations lead us to the discovery that we really have four different roles in CoE which we call Character Roles. Character Roles are divided up into 4 categories. Producer, Supplier (Merchant & Gatherer), Explorer, and Champion. The Producers are the crafters of the world. They're the blacksmiths, bakers, alchemists, and tailors. In general, Producers stay within the safety of a town and rely on suppliers to go outside and fetch the things they need. When they're not crafting they're selling their goods in a storefront or auction house. Suppliers, which are further divided into Gatherers and Merchants, are those responsible for getting necessary resources to Producers. Between the two of Suppliers, Gatherers are your miners, lumberjacks, and farmers and tend to gather the more mundane resources. Meanwhile, Merchants travel long distances in order to requisition the more extraordinary or rare materials. In either cases, it’s not uncommon for both Merchants and Gatherers to use large wagons and keep bodyguards around. Champions are the bodyguards, sell-sword, soldiers, and dungeon-delvers of the world. When Explorers discover uncharted new territories, it is the Champion who proceeds forward and gives the all clear. When merchants makes their way along dangerous trade routes, it’s the Champion who keeps them safe. As a player, your tolerance for risk and the types of activities you like to do will help you determine which Character Roles are suitable for you. While players may have different opinions about which skills makes up the best Champion, Explorer, etc., every character is made up of a combination of skills that span six top-level categories. In general, Champions will be made up predominantly of Combat skills, Explorers of Survival skills, Suppliers of Gathering Skills, and Producers of Crafting Skills, however the flexibility to customize is what makes CoE truly unique. The remaining two skill trees: Deviant and Bardic can be combined with any of the other four trees in order to create unique character personas. The details of each skill tree is listed below. Combat: Combat skills relates to a character’s ability to fight. This includes fighting unarmed, with 1H and 2H weapons, with thrown and ranged weapons, and utilizing additional tactics such as two-weapon fighting, and sneak attacks. Survival: Survival skills relates to a character's ability to survive in the wilds. This skill tree is about finding food and water, tracking prey, bandaging wounds, and navigating your way through the wilds. Crafting: Crafting skills relates to a character's ability to produce goods. These can range from consumables such as food and drinks, armors and weapons, furniture, and fine jewelry. Gathering: Gathering skills relates to a person's ability to gather and process raw materials. This includes skills involving the identification and handling of organic materials such as plant and animal byproducts, as well as inorganic materials such as metals and gems. Deviant: Deviant skills are those less savory skills that may aid in surviving more urban areas, if you don't mind the steep risk associated with pickpocketing, purse cutting, crafting false identities, and forging documents. Bardic: Bardic skills are the skills of the academic and the performer. Whether it's performing music to embolden their allies, reading ancient languages, performing forensic analysis to track down a murder, or creating finely detailed maps, the bardic tree is about information and discovery. 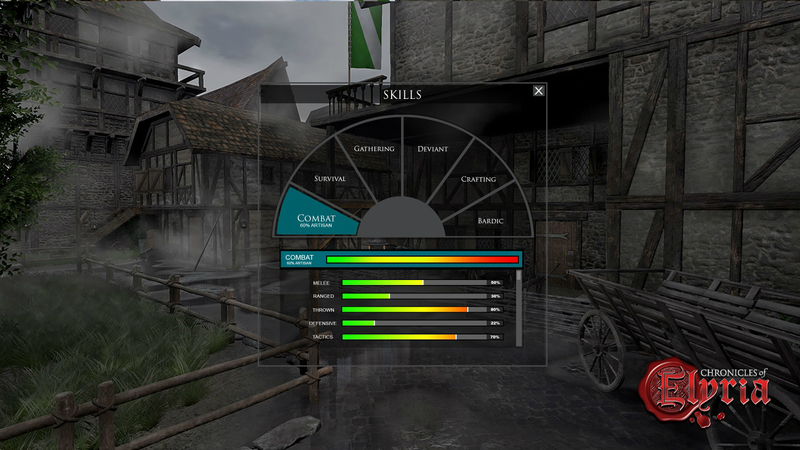 Figure 2 – Early In-game view of the Skill view. Beneath the top level of each skill tree there are secondary and tertiary skills which are referred to as Parent Skills. For example, below the Combat tree there is Melee, Ranged, Thrown, Defensive, and Tactics. Each of these is a Parent Skill which contributes to the successful execution of skills below. As an example, 1H Axes, Swords, and Rapiers are all type of One-Handed Combat. Improving in One-handed Axes causes you to get better at One-Handed Combat. As a result, you'll see a small gain in all types of One-Handed Combat, including swords, rapiers, maces, and daggers. This represents generalized learning. In an attempt to discourage endless grinding we instituted a system of diminishing returns which we call "rewarding for failure." If you attempt a skill that is too easy for you, such that you can never fail, you won't learn anything and will never improve. In contrast, if you attempt something just beyond your current skill level, you’ll see a lot more character growth. After all, we learn a lot more from our failures than we do from our success. Put differently, we calculated how long it would take people to reach Legendary status over several lifetimes if they did nothing but work on advancing a skill. Obviously, that's not going to happen. So as people train and improve, the Soulborn Engine monitors progress and provides bonuses as necessary to ensure the top 1%, 10%, etc... will eventually reach the Legendary or Grandmaster tier. You should also note those skill tiers carry across reincarnations and it will, in general, take a lifetime to become a Master, multiple to become a Grandmaster, and several to become Legendary. All skills in CoE require a minimum amount of training in order to perform. Attempting a skill with a skill rating of 0% will always result in failure. To attempt a skill for the first time it'll be necessary to first receive training. There are a number of ways and places in which to receive training. In most cases it's possible to gain the minimum necessary training to begin practicing a skill simply by reading a book about it. In fact, in most cases, given a full encyclopedia on a subject, it's possible to raise a skill all the way to Apprentice. Beyond that, it requires specific, rare texts to raise your skill in this manner. Characters with the Scholarship skill can teach you other skills they know. This is generally an interactive process requiring both people to be online, however, sufficiently skilled characters can teach others via their OPC. To continue to gain knowledge through formal teaching, it's necessary the teacher have both sufficiently high Scholarship skill, and sufficiently high proficiency in the skill they’re trying to teach. In this way, it gets harder and harder to find good teachers the better and better you become. In addition, they often say the best way to learn is to teach, and while that’s not 100% true here, teachers do develop their skills while teaching, in the same way they did before as the student. Having a skill above 0% allows you to gain some skill points simply by observation. Being near someone performing a skill enough times will result in a passive knowledge transfer. However, root-level skills cannot be advanced beyond Apprentice via observation alone. Once your skill goes above 0% you can begin practicing most skills on practice equipment. In the case of combat skills this will often be practice dummies. For other types of skills there are specific practice tools available which, through repeated use, can help slowly advance your skills. It’s assumed people will use these practice tools while offline via their OPC. Practice tools cannot be used beyond Journeyman skill level. One important thing to note, we believe “time = money.” As a result, practicing crafting professions that would normally consume natural resources in other games does not do so in Elyria. Later this week we’ll continue with part two of this two-part series on Skills and the Skill System and take a deeper look at the skill trees, as well as go in-depth into crafting and recipes. What is the problem with people posting most of the ones posting are new. Let them feel exited and converse with each other. Your comment was highly unnecessary. Stop posting here, please, it's almost a year old. This reminds of sword art online anime. I love how this would ideally work! It reminds me of some web novels that I've read before, like ARK, and LEGENDARY MOONLIGHT SCULPTOR. Though the games in these web novels are often in VR platforms, it would still be splendid seeing them in readily available platforms in this generation. Hopefully there may even be more addition to the professions in the game, such as sculptors, fishermen, etc. But right now, I'm very much looking forward to the game itself! It would be really cool once you reach the higher tier of crafting to share that knowledge in a form of class to more than one person. Am i weird that i want a family of bards who tame Lemurs with beautiful sound. I understand that skill advancement transfers partly from generation to another, is there a way to boost or affect this? For example lets say you have chosen an heir, can you start training him in certain skills already to give him/her extra boost to start with, or can you send your heir to an apprenticeship to learn other skills you might not possess yourself but would like your heir to have? It's unlikely that your heir will be able to be sent for training, since npc children designated Heirs more or less float in the ether until your soul inhabits them, since you always begin to inhabit an heir at the age of 15. On the other hand, when you inhabit a body, the body begins with a few skills based on who their parents were, so if you were dedicated to your skillset, something might rub off on your offspring. > I understand that skill advancement transfers partly from generation to another, is there a way to boost or affect this? For example lets say you have chosen an heir, can you start training him in certain skills already to give him/her extra boost to start with, or can you send your heir to an apprenticeship to learn other skills you might not possess yourself but would like your heir to have? > > @Daethos - 2:42 AM - Tue Jun 07 2016 It's unlikely that your heir will be able to be sent for training, since npc children designated Heirs more or less float in the ether until your soul inhabits them, since you always begin to inhabit an heir at the age of 15. On the other hand, when you inhabit a body, the body begins with a few skills based on who their parents were, so if you were dedicated to your skillset, something might rub off on your offspring. Ah, I'm sorta relieved. I was just getting tired with other games where I constantly have to grind and battle monsters. Not that I'd really get anywhere with that, though. And on the books part of this, would it be like Skyrim, where the books actually have text? Ah, I'm sorta relieved. I was just getting tired with other games where I constantly have to grind and battle monsters. Not that I'd really get anywhere with that, though. And on the books part of this, would it be like Skyrim, where the books actually have text? Okay. I'm extremely excited now, because there are times when I don't want to explore. To have the option of being a craftsman or a gatherer, or a bodyguard, is a fascinating feature. "You should also note those skill tiers carry across reincarnations and it will, in general, take a lifetime to become a Master, multiple to become a Grandmaster, and several to become Legendary." This answered my previous question, love it! No profession experience loss. @Devlonas and @Tarik: From what I gather if you dabble in it all each and every lifetime you should still get the skill advancement buff thing each new life from them it just won't be as large as if you say focused only on blacksmithing. (also if you spend a very vast amount of your life playing you could also achieve this just by playing more then "average.) But that is just my thoughts on it from what I have read. But what if I -like- doing all those things... exploring, fighting, gathering, and crafting? I'm forced to choose one at the expense of the others? Since the game design seems to do away with "alts" in the traditional sense, how can I get my fix for this variety of activities. That is exactly my concern as well, I like doing a lot of things, for example, in Skyrim, I loved gathering produce (herbs, etc), skinning animals to get their body parts, forging armour and weapons, fighting, exploring, you name it, all of it! There should definitely be a trade-off but with enough determination, will power and consistency, the game should let you through several lifetimes, become a sort of master of several skills, like a Ninja of sorts. It should be very hard, but possible. Have either of you gentlemen heard the term "Jack of all trades, master of none?" You can do all these activities, but you wont be great at any of them, just sufficient. But... would you honestly expect to be WAY better at exploring if you only do it once a week, versus a guy who explores every single day? And then there are the people who have a nature knack for such things. If you are inherently a great explorer, you will be a great explorer with little effort. If you're able to be great at everything with little effort, that would suggest you're meant to be a Legendary player simply because of your own, personal skill. This looks so awesome, can't wait to try it!! Can´t wait to hear more about it. Nice, I´m really hyped :D Can´t wait to hear more about it. Can we have a profession along the lines of crafting these skill books? Like, librarians/scribes type of thing, and that is their specialty? Based on everything else I'm seeing about the game, this will be the ONLY way to obtain them. This seems like a very player-driven game. The more I hear about this game the more excited I get. I love the concept that you need someone to find dungeons and world events so the players may do it!